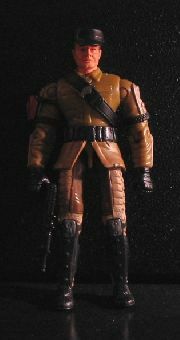 - AK variant: Marauder Inc.
Brigadier Volker is a Namibian of German descent who spent his early youth as a safari guide in the Kalahari desert. His sense of adventure and familiarity with the outback led him to fight in some of the bush wars of the 1980s. With the drawdown of the war in Angola, Volker linked up with Cobra, admiring their organisation and ambition. 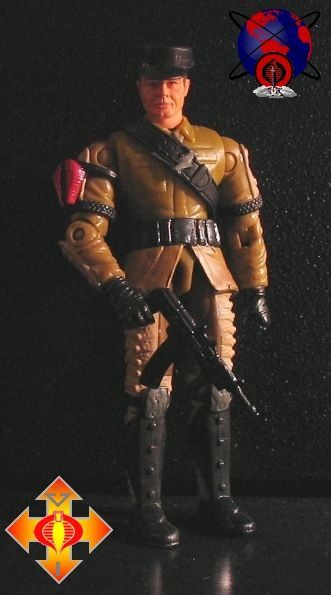 Eventually, he became a Troop Commander with Cobra's Long Range Desert Scorpion Group, a natural fit for a man of his background. He has since fought in operations in Trucial Abysmia and Benzheen and has served as Governor of the Jahkhal Oasis of the Central Saharan Emirate, a Cobra client state. He is currently the Commander of the 6th Viper DEMONS* Brigade Group (formation patch pictured), home of the Rock-Vipers and various Cobra desert troops.